Terry Ellis a fighter pilot who served his fellow Americans with distinction and with love. His affection for the Academy, the military, the Air Force, and his country were all encompassing, never wavering. It endured throughout his entire life, an inspiration to all his comrades in arms. Terry died in Montgomery, Alabama, deep in the Southland of his heritage, his upbringing, and much of his service. He had retired there because he felt at home. He liked the environment and the people. They liked him. His final years as a civilian were, in his own words, “meaningful and fulfilling,” a blend of the best in old military companionships and the warmth of his many civilian friends. Terry was born in Columbia, South Carolina, on 28 June 1919 into an Army family. He would have had it no other way. His father, Arthur Monroe Ellis of Baxter, Tennessee, a West Pointer before him (Class of 1916), was clearly the motivating force behind Terry’s early interest in a military career. Raised in such far-flung places as Hawaii, Kansas, Arizona, and Tennessee, Terry’s respect and admiration for his father and his profession pointed inevitably to the Hudson Highlands. His mother, Florence Klein Ellis of Charleston and Columbia, South Carolina, gave grace and warmth and honesty to everything she touched, including her son. Although he saw much of the world and his country, first as an “Army Brat” and then as a flying officer, Terry remained a son of the South all his life. His schooling was military almost from the start. High school was started at Tennessee Military Institute and finished at New Mexico Military Institute. A few years in the Reserve Officer Training Corps program at the University of Tennessee, service with the Tennessee National Guard, studies as a Guard appointee at the West Point Prep School at Fort McPherson, Georgia, eventually an appointment to the Military Academy from Congressman Mitchell of Tennessee, and at last West Point on 1 July 1939 — all moved Terry toward his life’s work. World War II arrived with a bang during his cadet years, bringing with it an explosive demand for pilots. Terry was quick to grasp the import of air power and sense the thrill of flying. Along with many classmates, he took flight instruction in the Air Training Command in the last half of 1942. His wings were awarded in December 1942, and Terry returned to the Point where the Air Cadets joined those who had remained for graduation on 19 January 1943. After fighter upgrade training in P-40s at Craig Field in Alabama, he was assigned to the 58th Fighter Group for a checkout in the P-47 Thunderbolt. No desk pilot, Terry flew 144 combat missions (410 combat hours) in New Guinea and the Philippines from October 1943 until April 1945. Credited with destroying a “Zeke,” decorated with the Distinguished Flying Cross, five Air Medals, and the American and Philippine Unit Citations, Terry left his mark on our victory in the Pacific area. Like other young tigers with outstanding operational know-how on the record, he was called to Air Force Headquarters in the Pentagon to help plan and build the postwar Air Force. Three years there in Operations Requirements matured his staff capabilities and allowed him to be among numerous Air Force and Army classmates who also were stirring up the Pentagon pot while they relaxed amid the delights of a Washington at peace. He moved on to the 56th Fighter Group at Selfridge Air Force Base in Michigan where he flew the first United States jet, the F-80 Shooting Star. As Group S4, he also learned the necessity for sound logistic support. Fifteen months later, he was off to the 49th Fighter Bomber Group, Misawa, Japan, still flying F-80s. The Korean war interrupted this “routine” assignment, with his unit being transferred to Taegu. Another 100 combat missions and 210 combat hours later, after being awarded another Distinguished Flying Cross, eight more Air Medals, and the Korean Unit Citation, Terry had fought his second war. He was soon on his way back to the States for important duty as a Fighter Project (Test) Officer at Eglin Air Force Base in Florida. His extensive combat fighter experience plus his solid grounding in fighter requirements planning in the Pentagon suited him ideally for this specialized duty. As the major operational proving base of the Air Force, Eglin was at the leading edge of fighter development. Terry was completely at home in this environment. A son, Terry Jr., later to graduate from the Air Force Academy in 1973 and follow in his dad’s footsteps as a fighter pilot, was born here in February 1952. After graduating from the Armed Forces Staff College in 1957, Terry was sent to Germany for duty with United States Air Forces Europe. After three and one-half years of absorbing the special aspects of North Atlantic Treaty Organization tactical air operations in confrontation with the Warsaw Pact air forces, he was ready for another Pentagon tour with Deputy Chief of Staff, Plans & Operations, this time for four years. It is unlikely that, at this point, many officers knew as much as he did about worldwide fighter operations. In 1965, he went back to Japan for a three-year stay as Chief of the Air Force Section, Military Assistance Advisory Group, in Tokyo. His highly valued counsel to both his own and the Japanese governments was a key factor in upgrading the fighter capabilities of the Japanese Self Defense Forces. Much to his disappointment, Terry was not able to get a tour in Vietnam. The Air Force had higher priorities for his wide and varied experience in the wartime application of tactical air power. His final active duty task was at Maxwell Air Force Base as Deputy Chief of “Carona Harvest,” a highly classified project to study the role of air power in Southeast Asia. It is comforting to know that his skill and judgment were recognized and employed in this highly significant documentary effort. After thirty-nine years in a military uniform of one sort or another, Reserve Officer Training Corps, National Guard, United States Military Academy cadet, Army Air Corps, and United States Air Force, Terry retired as a Colonel at Maxwell in March 1972. He was soon diligently working on — and enjoying it thoroughly — his master’s degree in counseling and guidance, totally a part of the wonderful civilian-military community in Montgomery. Helping him to “adjust” to the civilian lifestyle was his lovely wife Jo Ann, in Terry’s words, “a long-time totally civilian resident” of the city — one of whom he was obviously quite proud. The untimely death of Terry Jr. in a mid-air collision while flying an F-4 fighter on a training mission over Korea on 30 January 1976 was a hard blow to an old fighter pilot. Terry took it with the courage that had sustained him all his life and pressed on with the business of living, counseling young people, tending his tropical plants, and playing a little golf. An active member of the local chapters of the Air Force Association and the Society of Daedalians, he retained with pride his “blue suit” and military aviation patriotic interests. In addition to the combat decorations already mentioned, over his years of distinguished service Terry was awarded the Legion of Merit, the Army and Air Force Commendation Medals, and two Presidential Unit Citations. One fact that should not go unrecorded is that Terry’s skill as a math coach is all that kept his plebe roommate from a forced early departure from the Academy. This same roommate recalls with pleasure the times when Terry’s ringing tenor voice honored the barracks with the same talent he used to bless the chapel choir and the glee clubs. His staunch resolution to become a “good soldier” rubbed off on this roommate, helping in more ways than Terry ever knew to carry him through the Academy. Terry was a real military professional from boyhood, recalls his lifelong friend, George Pickett (United States Military Academy, Class of 1941). In 1933, he and Terry were freshmen at Tennessee Military Institute. One afternoon, while all their contemporaries had gone to town to celebrate an off afternoon, the Assistant Professor of Military Science and Tactics found them polishing and cleaning their field gear. “Why are you here working?” he asked. “Because,” Terry replied, “it needs to be done right and now.” That attitude reflected his outlook for his entire career and subsequently in retirement. Terry’s death was the result of one of those tragic accidents that in retrospect are almost unbelievable. A choking incident at a dinner with friends, and the consequent cerebral hypoxia, left him unconscious but struggling valiantly for ten weeks. His doctors said they had never seen a man try harder to come back and live. Terry was a fighter to the end. In life, as a pilot, he always felt he could “put out his hand and touch the face of God.” I am certain God was holding Terry’s hand as he joined the Long Gray Line. The large contingent of West Point classmates in the Washington area turned out en masse to join the United States Air Force in bidding farewell to this sterling patriot and superior officer. Representing the Chief of Staff of the United States Air Force was the Inspector General, Lieutenant General John Flynn, a long-time close friend of Terry’s. Never were the military honors that Arlington handles so beautifully so well deserved. Terry has joined his father and son for a well-earned rest with our nation’s finest servants. Surviving are his wife, Jo Ann McGowan Ellis; his mother, Florence Klein Ellis, both of Montgomery; and his sister, Mary Ann Ober of Burnsville, Minnesota. Knowing Terry and sharing his life was the most meaningful and beautiful experience of my life. To know him was to admire, respect, and love him. He was a man of honor, and his memory I will always cherish. 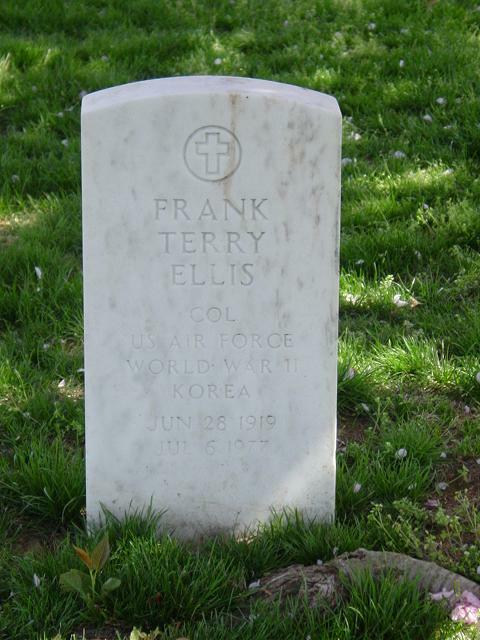 Colonel Ellis was buried with full military honors in Section 4, Grave 32190B, Arlington National Cemetery.